My usual rambling and jumble mumble ... now in a blog for everyone to see. In the middle of March 2011 the world was astonished by the images of the earthquake and the tsunami that desolated Japan. Millions of people around the world prayed for the victims of this natural tragedy. Donations of different types started flowing into japan from all over the world to help the affected people. As if this weren't enough, the Japanese government has committed 74 million dollars (in posteriors press declaration they promised 40 million dollars, still a ridiculous amount of money) to help equip the Whaling fleet, and promised to send a patrol ship to protect the whale murderers (last year they were unable to fulfill their governmental quota due to the interference imposed by the ecologist group “SEA SHEPHERD”). According to the information from several sources (wikipedia,JE&SR, Yahoo , and others), after the March disaster the Republic of JAPAN has received about 200 million dollars in cash and another 200 in material goods, now the Japanese government plans to use between 10 y 20 percent of it in order to kill whales. If the Japanese government can waste many like this, is pretty evident that they do not need any kind of donations. 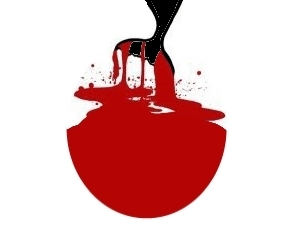 An old Scuba diver told me once that the red disk in the Japanese flag is not due to the "Raising Sun" but to the blood of the whales they have killed. I leave you my visualization of that concept. Finally, I invite you to visit the wonderfull "Secretos del Mar", by Tito Rodriguez (who was my scuba diving instructor and a real passionate of the sea). 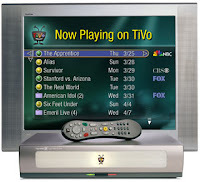 One of gadgets that fascinated me in the USA is the TiVo, a device that can be described as a VCR without tapes, but TiVo is much more than that. How would you like being able to watch live TV and then pause it to go bathroom? Or rewind it to see again details that you might have lost? TiVo allows you to do this and more. 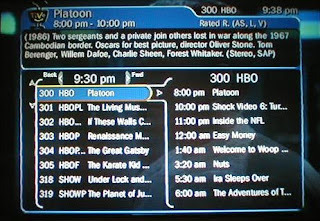 If you live in a country in which TiVo CORP has activities, your TiVo will connect every night to one of their servers and download the TV programming guide for the following the 2 weeks. With this information allows the device to do some really cool things: you can forget about specifying the channel and the time in order to record a program just browse the programming guide and select the program to record. Or just ask it to record all programs with “Star Wars” in the title, or any comedies staring “Jim Carey”, and TiVo will do it automatically. 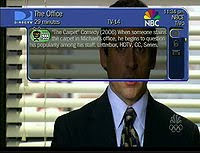 Beyond the user interface, TiVo is just a computer. But this is not an ordinary computer. Every TiVo has an integrated TV tuner (similar to those found one any VCR), a MPG coder (turns the Video into MPG-2 files) and a MPG decoder (turns MPG-2 files into video). One of the limitations of these units is the processor, which is old and slow. 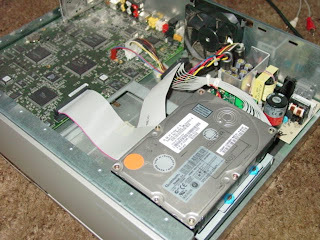 Since the unit contains dedicated circuits to handle the Audio and Video conversion, there was no reason to include a more powerful (and therefore expensive) processor. Besides storing Video, the hard drive contains the operating system (a version of Linux). And this is one of the greatest news for computer geeks. By using Linux OS, TiVo Corp. it is forced to freely share all the improvements that they make and distribute, and that greatly benefits the community. TiVo has fulfilled that commitment (although they usually take their time), but have also generated a great debate by refusing to share those programs and libraries that they developed “from scratch”; some interpret that all improvement (including new libraries or programs that implement existing libraries) must be shared freely, whereas others maintain that only improvements to existing elements must be shared. If this was not enough, TiVo Corp. restricts (by digital signatures) the software that can run on this equipment; Once again, some people interprets that this goes against the rules of GNU GPL (the license that regulates the use of Linux and other programs), while others interpret that it’s perfectly OK. This is called Tivoization and a great debate has grown around it, to the point so that the Free Software Foundation has decided to publish an updated version of the GPL that clearly prohibits this activity. 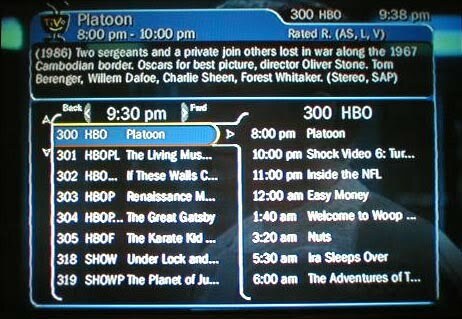 TiVo is a not the only product of its kind, ReplayTV and the new DirecTV+ have similar characteristics. You can even grab a regular PC, add a TV or Audio/Video capture card and a specialized software (Windows' Media Center, and MythTV are some of them), and you have a DIY product with similar characteristics. But TiVo was first to have a massive presence in the market, and one of simplest to use. As with most technological products, user groups soon formed, sharing knowledge, and trying to add functionality, discover hidden options, or simply to learn how things works. There are several such TiVo groups, but the 2 best known are TiVo Community (http://www.tivocommunity.com/) and Deal Database (http://www.dealdatabase.com/), this sites became forums for knowledge transfer and sharing, and the community soon started to adapt some common Linux applications to work on TiVo, and developed techniques to avoid the restrictions that TiVo CORP implemented to avoid external programs. Soon a large number of applications were available for TiVo: FTP clients and servers, email readers, RSS clients, Caller ID, games, websites showing the recorded programs, and even tools to transfer recorded programs from TiVo to a PC. One of the premises on “TiVo Hackers” communities is that their work should not be used to undermine TiVo Corp.’s income in countries where they offer service. We believe that TiVo is a magnificent product and nobody wants to damage TiVo Corp., for that reason we try to ensure that the information we share will not be used to use the product without paying in the markets that TiVo covers. Today I needed to make this script work behind a proxy, something that I have found in the past but was not able to find a good set of instructions. I got it working and I wanted to share it with you, in case someone else is looking for it. Recently, thanks to some former students from the Liceo Naval Almirante Gullermo Brown, I came across this poem from General Douglas MacArthur, I found it really amazing and I can surely identify myself with the feeling. I'm here watching the end of the firework celebration of july 4th, 2010, for me this is a very special 4 of july. This is not my first independence day firework. My first was back in 1990, when Stella (rest in peace) took her younger daughters, Melissa, Jennifer and Pamela to a 4th of july picnic at a park in the outskirts of Chicago. I'm not sure if she invited me or I invited myself :-), the thing is that I went along. I still remember the hundreds of people, the countless blankets on the grass, the live music band, the food carts (yeah, I like food), and the stands selling chemical lights, blinking wands, american flags and pins. This was also the first time I've seen such a wonderful firework display coordinated with the live music. Certainly something that I will never forget. As I look around tonight, I can see new york, Staten Island and a few dozen NJ townships and most of them have set up their our fireworks, and while the are quite far away, the view is breath taking. But this is certainly not the greatest firework show I've seen. I think that the best one was back in 2005, when we (Nahuel, Nicolla, Paola, and me) drove 9 hours each way to spend independence weekend at the Niagara Falls. That night was AMAZING, the number of fireworks, the music in the speakers (recorded music, but sounded really nice), and the illumination "coloring" the waterfalls was really nice. Laying there watching the show with friends by my side, and a drink on my hand, was really awesome. I remember many other 7/4 celebrations, flipping burgers with friends, watching illegal fireworks, drinking beers on the porch, etc. Yet, today is the most special one, because today is the first time I watch it as a US Citizen, today I'm celebrating MY country's birthday. Many times we need to apply a registry file (.reg) to our many systems (1400+), and it's a real pain ... specially that we really like using Group Policies for everything. 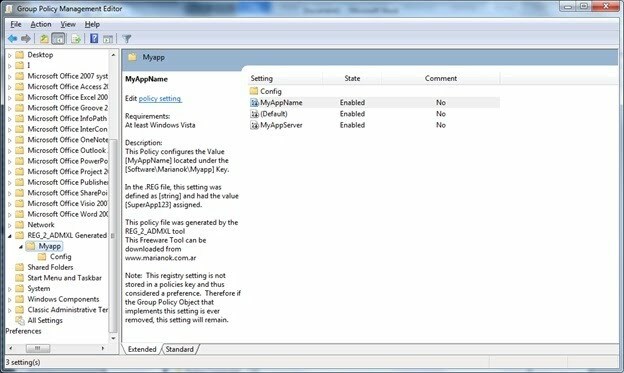 if it's just a few values we create an ad-hoc registry policy and set the values thru GPO, but when we have a large .REG file with a lot of settings things become a lot harder, and we have to start dancing around figuring out how to best deploy this settings. In the past, I attempted to create an ADM file for a couple of our most common application, but I gave up due to the complexity of the ADM syntax. Last weekend I was thinking about this again and I decided to give it another try. 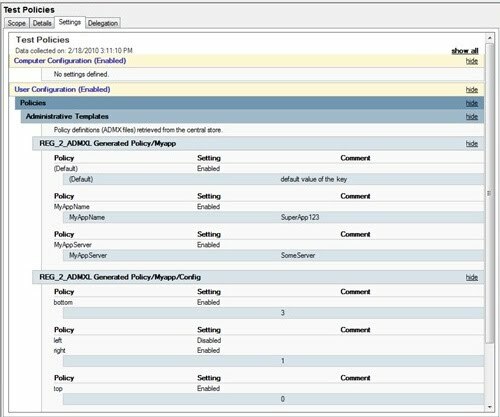 I did not want to use and "old" standard, so I decided to research the ADMX policies. I opened the ones I found in my systems and it seemed pretty simple to understand. So I downloaded the ADMX samples and the schema/syntax definition from MS and got to work. Luckily for me, the syntax is really simple, XML simple, and I quickly realized that instead of creating a new ADMX to apply the setting of my problematic .REG file, I could create a tool to parse any registry file into a corresponding ADMX policy definition. It took me the whole weekend but by 2 AM Monday I had a functional (and much debugged) tool. I did not had any development tool installed on my system so I decided to use good-old VBScript to write the tool. This has the added bonus that anyone can read it and update it without much requirements. 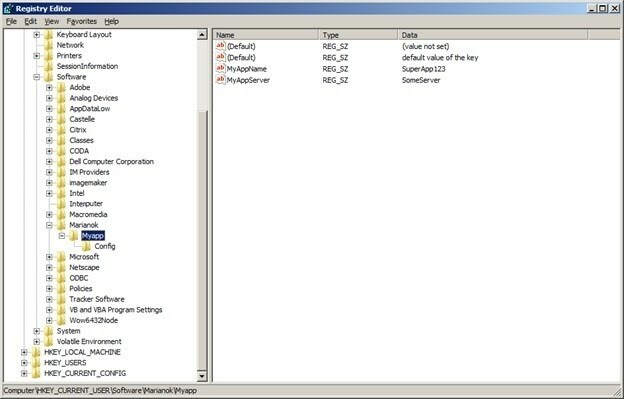 @="default value of the key"
Once you have the ADMX and the ADML files you can use them in the Group Policy Management Console to edit your GPOs more confortably. Notice that the diferent registry keys (the Path) became nodes on the tree, and that the "Config" Key is correctly subordinated to the "MyApp" key. 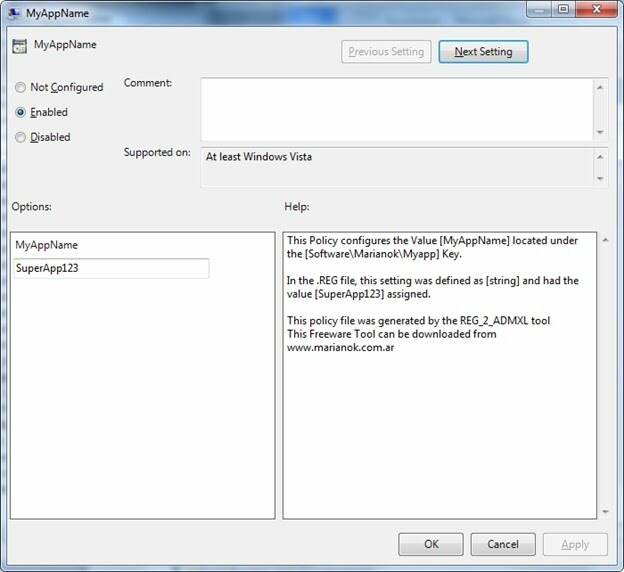 Also notice that in order to help the people that might be using this ADMX file in the future, the tool will add a description to each one of them detailling what keys is being affected. Here one of the values was selected. Notice that the "@" from the .reg file was replaced with (Default). Also notice that the tool has added a comment to each setting detailling what registry value will be affected, what was the datatype reported in the .reg file and what was the value assigned in the original .reg file. Same for the MYAPP\CONFIG node. Notice that there are 4 values, but only 3 are enabled (only this 3 will be applied to the targets). In this screen you can see one being edited. Once again you can see the description/help that was created by the tool based on the .reg file. Also notice that the value that was assigned in the original .reg file has become the default value for the field. This is a millon times more readable than the mess of registry keys and setting that the GPM would be showing if we did not have the ADMX/L files inplace. Notice that only 3 values are listed under the CONFIG section, that it's because the fourth is still disabled. Notice the issue I was mentioing before with the (DEFAULT) valuename. There are 2 of them one without data and the other witht he data we were trying to assign. Had I imported the registry file into this system the first one would have a value ("default value of the key"), but this is not happening. Here is the Config folder, notice that the fourth value does not show, just as expected. A few months ago I bought an old but nice (Pentium M, 1.5GB RAM, 30GB drive, wireless, Bluetooth) tablet to experiment and to use it as an eBook (in my opinion something far better than Kindle, the Amazon’s eReader). One of the things I wanted to test were the new features of Windows 7, but the machine has no CD / DVD, and I have no USB-DVD. I had read, long ago, that it was possible to create a version of XP that fit in (and boot from) a USB, so I decided to investigate whether it was possible to use a USB drive to install Windows 7. It seems that my idea was not original, because I found a dozen blogs and articles describing how this was done. After reading “ Install Windows 7 from a USB Flash Drive " and "Windows 7 on LE1600 - Installation from pen drive ", I decided to give it a try. I downloaded Windows 7 Professional from Microsoft.com and I borrowed a Sony USB 5 GB from work. I followed the instructions to the letter, but every time I tried to boot from the USB, the light blinked a couple of times and then it would just remain ON while the display only showed a blinking cursor. I thought that maybe the computer was slow to access the USB and it might only be a matter of patience. It was already 1 am, so I decided to call it the night and to leave the system running, but the next morning everything was unchanged. Researching a bit more I found that " How To: Install Windows 7 Beta from a USB Key! " recommends formatting the disk as NTFS rather than FAT. I decided to try again from scratch, and sure enough, it failed again (as Einstein would say: "only a fool does the same thing over and over and expecting different results"). There I remembered that a few days ago, while updating the firmware of a system at work, a vendor insisted about not booting from a USB over 2 GB. I figured there might be a connection. I had a 2GB USB, the issue is that the installation DVD of Windows 7 has more than 2 GB and therefore had not tried. I decided to test, at least to help determine the problem. Copied the whole disc except for a single file (\sources\install.wim), I knew that that file is the most important of the installation process, but I decided to continue, after all this was just a test to see if I could boot. I placed the USB on the table, and rebooted, and lo and behold! The Windows 7 Setup began to run. Of course, as soon as I clicked install, the program complained that he could not find the file. I Rebooted the system to try again. This time, the 5GB USB was read, but the installation failed as before. Looking around, I found a way to access the CMD, and I began to investigate. My hard drive was there, in the good old C: my 2GB USB was seen as D: and the 5GB as E:, the system was running from a virtual drive X: (later determined that it was based on information from \sources\boot.wim ). Last year we created the images for the 1200+ Windows Vista machines at work, and I became quite knowledgeable of the Windows installation process. 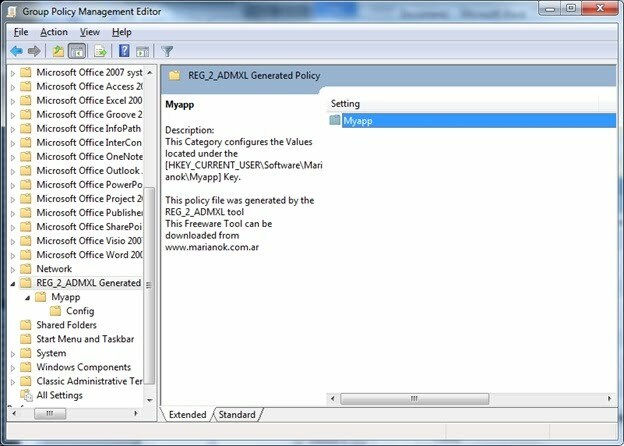 I knew that the installation program can told from where to take install.wim information. This option is primarily for organizations to put the file on a centralized server, or a modified version of the OS, but it should be fine for my needs. 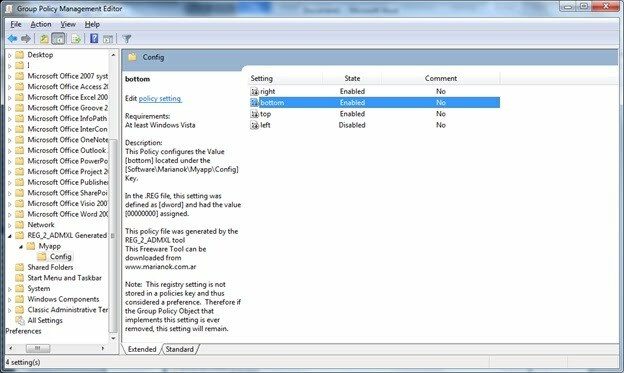 As far as I remembered, there were two ways to specify this setting to the installer process: through an “unattended installation file” (what we had done in at work to configure the VISTA machines), or through a parameter to the executable. I did not have an "unattended file" (nor the time or the desire to create one), so I decided to use the parameter InstallFrom for the executable. Once again, I went to CMD, and run " setup.exe /InstallFrom:e:\sources\Install.wim ", the installer ran, but gave me the same error than before. I tried a few variations (without the file name, from different locations, adding the directory path, etc), but none worked. I started to check the virtual disk X:, and navigated to the “Phanter” directory witch, I remembered my experience with VISTA, has the log and records of the installation process. After a while of reading those files (very entertaining, especially when using only TYPE MORE ), I realized what my problem was: The installation and was already running. This CMD window in which I worked had been launched from the installer and was running within the environment of the installation program, so every time I executed the setup command, the installer was restarted in memory instead of a new one being executed. That is why it was ignoring my parameters. The program was set to find the installers in D:\Sources, and there no convincing him otherwise. Thus, I had two choices: to create an automated installation file (unattended XML file), or tricking the system to use the USB 5GB instead of 2GB. I needed to replace an existing disk (D:) with another disk (E:), I knew the E: drive had all the same information from the D:, so if I could replace then I should have no problem even if the system tried to look for files in the old location. Had I have access to the disk manager I would had simply changed the drive letters, but this was not the case. Then remembered an old DOS 3.11 command SUBST which lets you assign a drive letter to a directory. It was a very useful command when, back in my PC-XT, we copied the games to the HD diskettes, sometimes a game would complain if it was ran from a directory, in those cases we used SUSBST to give it a drive letter and played the game from that “drive”. I wasn’t sure if the command was still available, particularly in the reduced CMD console of the installer, but turned out to be there. I gave it a “dry test”: SUBST R: E:\ ran smoothly, and DIR R: returned the expected result. After a bit of thinking, I realized that the installer was running on Windows (a reduced version but still Windows), and I knew that the plug-and-play was working (it had detected my keyboard as soon as I plugged in). I ran SUBST D: E:\ and it executed without errors, I did a DIR D: I got the expected results. It took me 3 days and many attempts, but finally achieved what I wanted! Most of the troubleshooting I did was using 2 very old commands TYPE and MORE , and also the solution was an old command: SUBST .